Shampoo is an essential product, and finding the one best suited to your hair (and hair concerns) is vital if you want soft, smooth and fresh locks. 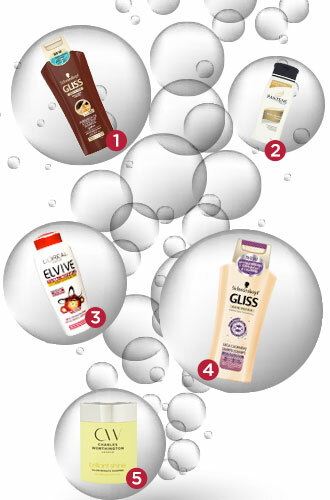 Take a look below to see which five shampoos received the most reviews from Beauty Addicts in 2013. Schwarzkopf Gliss Hair Repair with Liquid Keratin Marrakesh Oil and Coconut Shampoo contains liquid keratin to repair damaged hair and fill hair fissures. It offers deep care without weighing the hair down and provides more shine and suppleness. Weak, limp, damaged hair looks replenished, fullness restored. L’Oréal’s Elvive Full Restore 5 Shampoo is enriched with Pro-Keratin, the conditioning formula reinforces each hair fibre leaving it feeling strengthened and better able to resist daily wear and tear. For a striking boost to your hair’s natural shine, Brilliant Shine Shampoo is ultra-glossing designed to cleanse impurities and leave hair dazzling. As I’m always on the look out for shampoo, I am going to use the Schwarzkopf Gliss Shea Cashmere Shampoo this next while. The coconut, makes me think I’ll smell a summer beach on my head all the time. Dove Colour Radiance is my first choice in new shampoos and conditioners for 2013. Changed me from a Pantene girl to a Dove girl.